TripUSAFrance Rated Perfect 5/5 Tours! "Julia and Stephan are delightful and very accommodating to the needs and interests of the group. The sights in southern France are varied and unique to the area. I loved eating at places frequented by the locals and the picnic lunch catered by Julia's mom at the beach was beautiful and delicious. Accommodations at the beach were fabulous, as were the authentic breakfasts provided by the hotel. We saw so much--from walled cities to medieval castles to rides on Montpeiller's trolleys. Much better than fighting tourists in Paris. Wonderful vacation with a creative and energetic tour company. Thanks, Julia and Stephan!" "Julia and her father Stephan made this trip a very special one. If you are looking for a French provincial experience, this trip is for you. From the moment Julia met us at the airport we were treated like family. Julia is a young entrepreneur. Her enthusiasm and knowledge was evident everyday in the meticulously planned trips." " It was the first time that we visited France, so it was nice to live like a "local" and know we were seeing the best of everything! 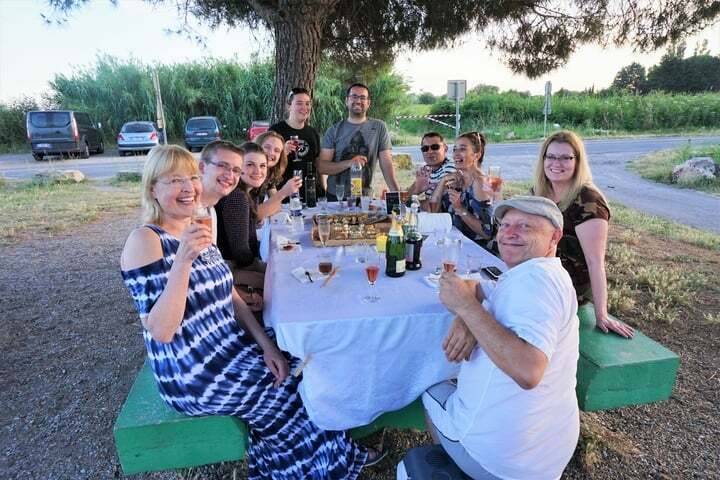 It was beyond our expectations- from castles, to wineries, to little Medieval villages [...] All the restaurants were authentic and delicious. It was also nice to not worry about the language barrier which can feel intimidating in foreign countries. Julia taught me a few phrases to get by, but was there every step of the way to translate when necessary. "